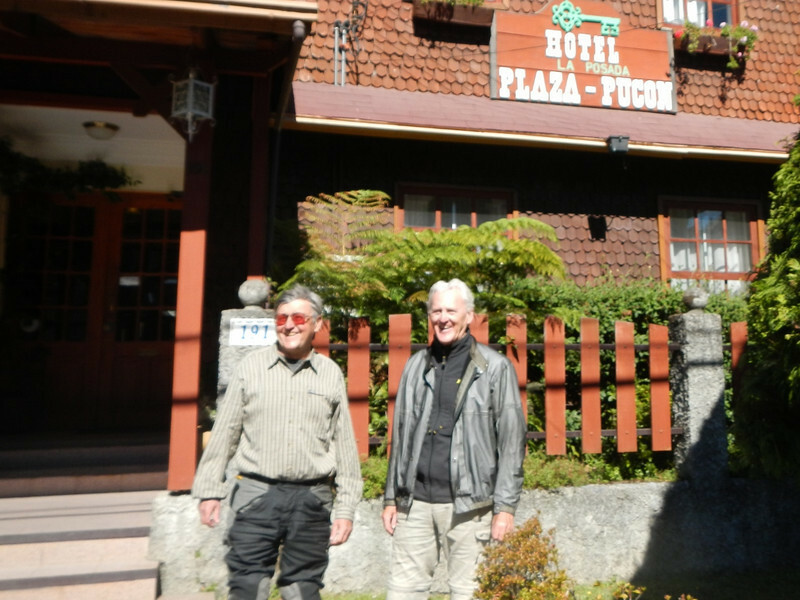 Finally, with the original six MotoRaiders back together, we assembled on the day before Easter to continue our journey south to Pucon, Chile. I came out to a flat rear tire on my bike… not a good way to start the day. I couldn’t find any explanation for the flat so discouraged I just pumped it up and rode off. 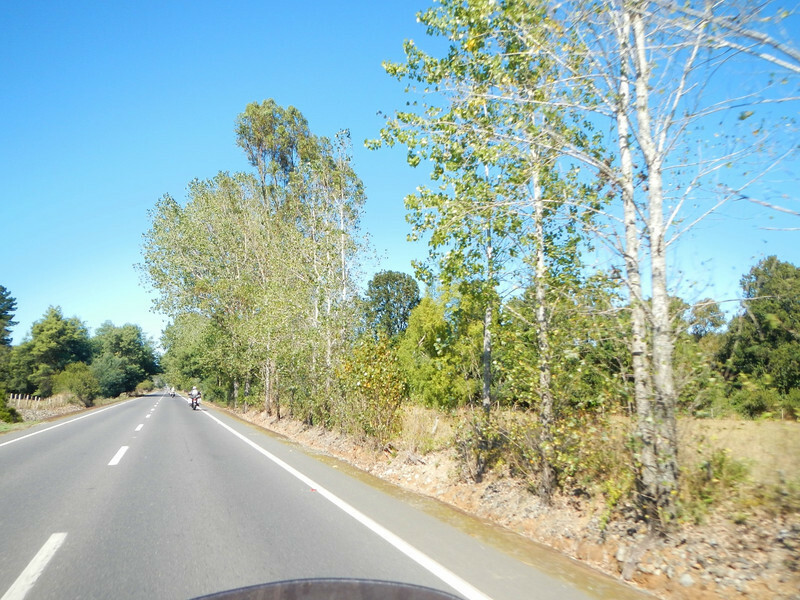 The route from Los Andes to our destination for the day, Curico, was on a four lane interstate highway called ruta 5. We called it I-5 since in all respects it was the same as our interstate 5 except for the additions of toll booths every 50 or so miles. The 182 miles was so boring I didn’t even take any pictures. 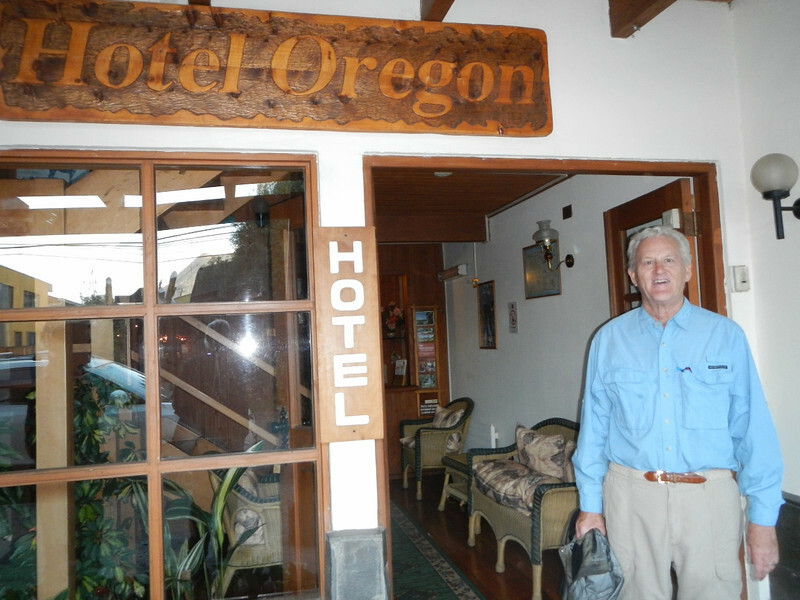 Because of the holiday we had reservations at what ended up being a nondescript but adequate hotel near the center of Curico. We learned that the main holiday is celebrated on Saturday and all the restaurants and most businesses were closed so we found an open supermercado and bought provisions for a dinner of sandwiches in the hotel lobby. At the hotel I checked my tire and it was slowly loosing air so I set up shop in the parking lot and replaced the tube with a new one I had been carrying for the past 14,000 miles. The tube had a small hole but I couldn’t find any protrusions through the tire. One of those mysteries of motorcycle travel. Easter Sunday we loaded up under overcast skies. 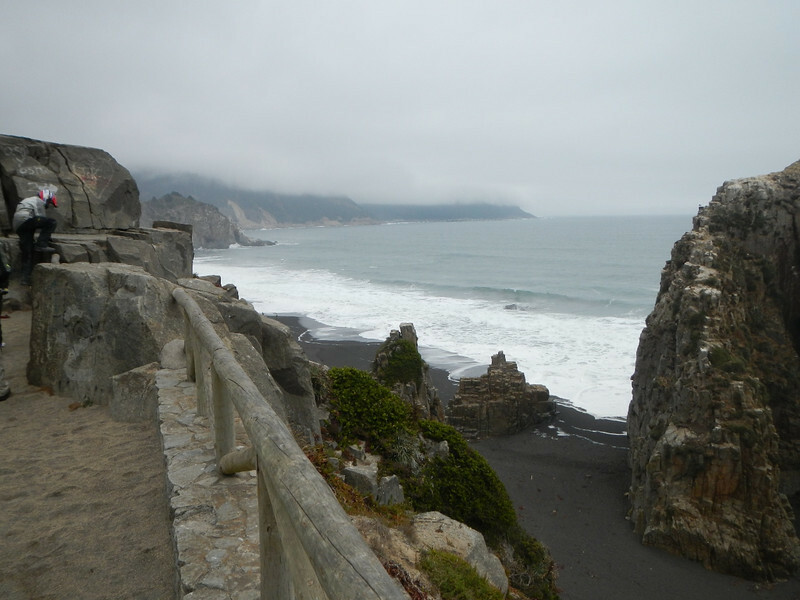 We were all tired of the boring interstate so we decided on a route west that took us along the Chilean coast line. Fall was in the air, the terrain, the trees turning colors and the overcast, damp weather made us all a little homesick for the Pacific Northwest. 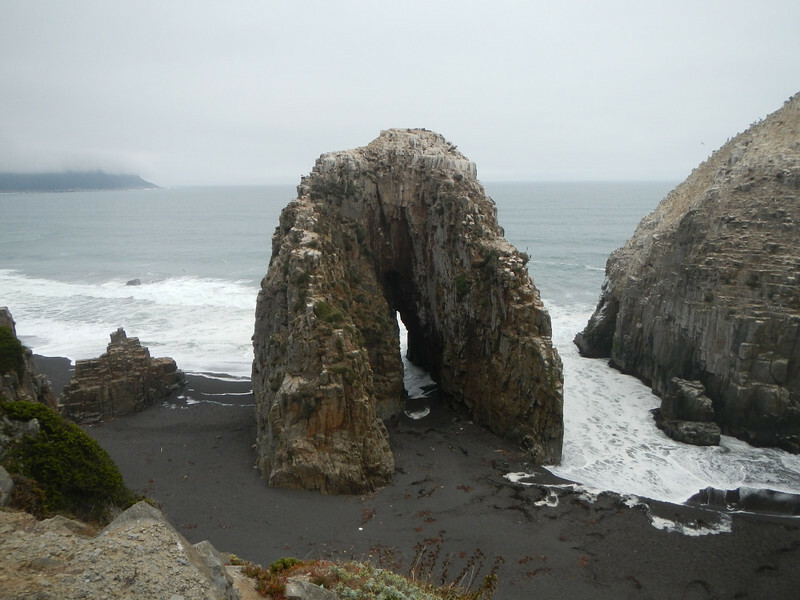 The rocky coastline near Constitucion reminded us of the Oregon coast. 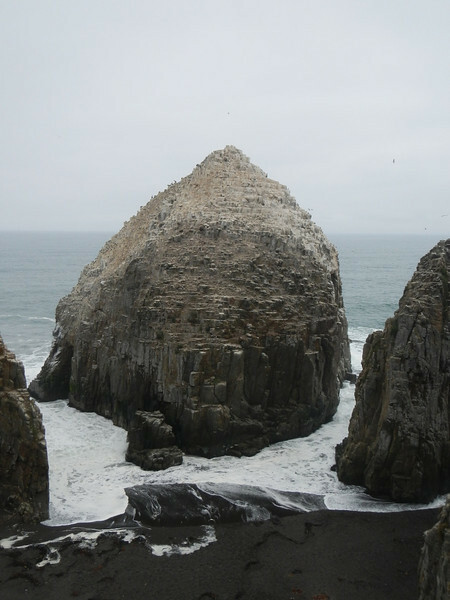 This rock was a bird rookery, full of birds and white from bird droppings. We stopped and climbed around for a while. The fog, coastline and temperatures were just like the Oregon coast. A short ways later the pavement ended and we rode for a dozen or so miles on nice graded gravel. I felt like I was riding in the North Cascades. Except for these good ol boys. 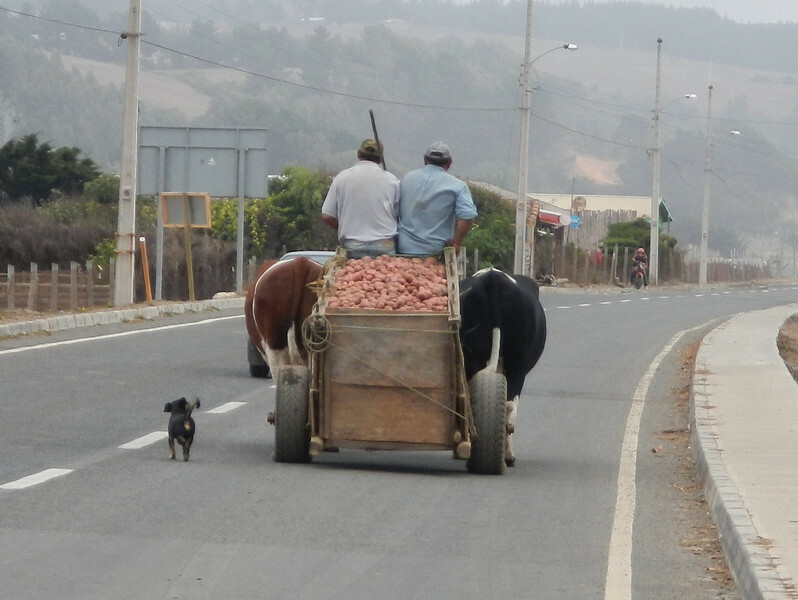 Bringing a load of potatoes into town. 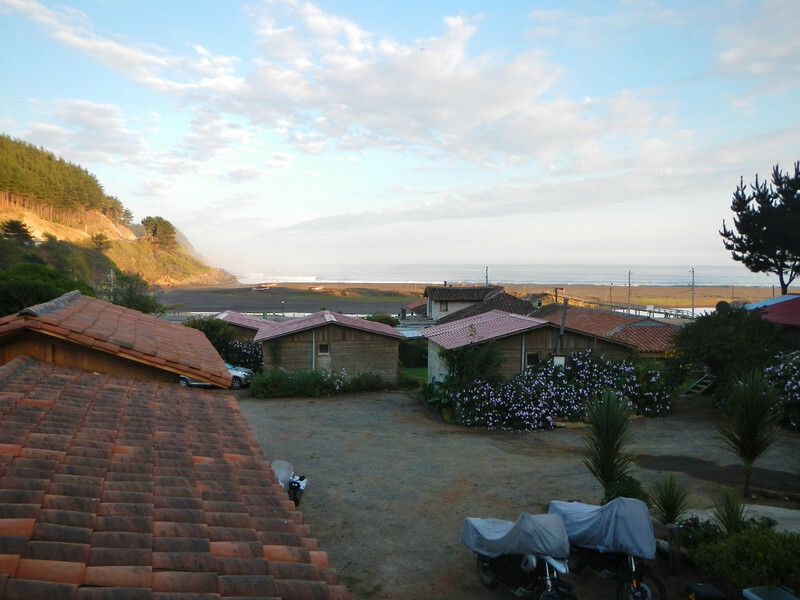 We found a nice little resort type hotel on a small inlet just outside the town of Buchupureo, Chile. A town so small there is not even a Wikipedia entry for it. Here is a picture I took from the deck of our cabana. We were glad to wake up on Monday to some clear sky. Monday we rode 170 miles along the coast to the small town of Canete. We arrived early enough to have time to walk about town. It was nice enough but nothing special. 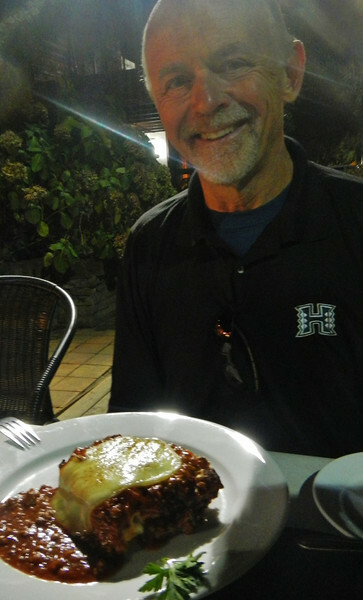 Monday was Jim’s birthday so Deby located a cake and we had a nice dinner to celebrate in the hotel restaurant. 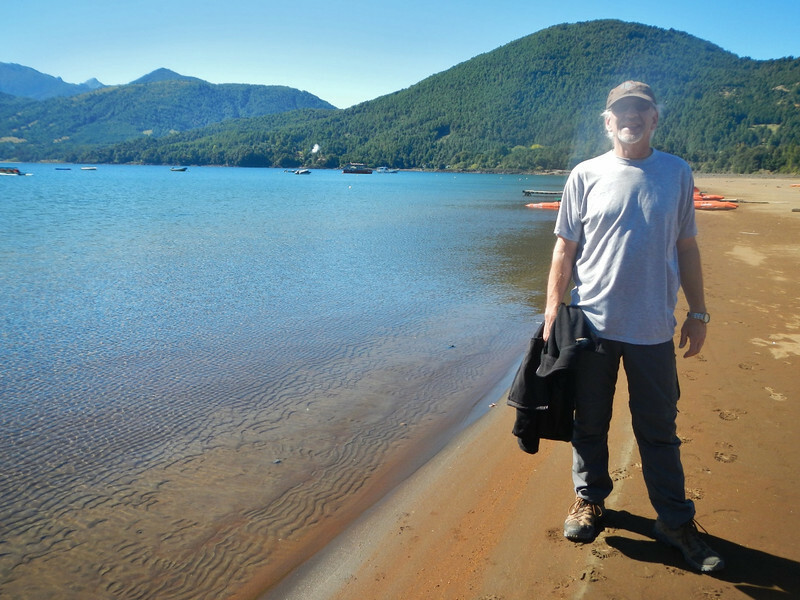 Tuesday was the day we would finally make it to Pucon, Chile. The sister city of Lake Oswego, Oregon that was the destination of Dave and Keith’s ride 50 years ago. 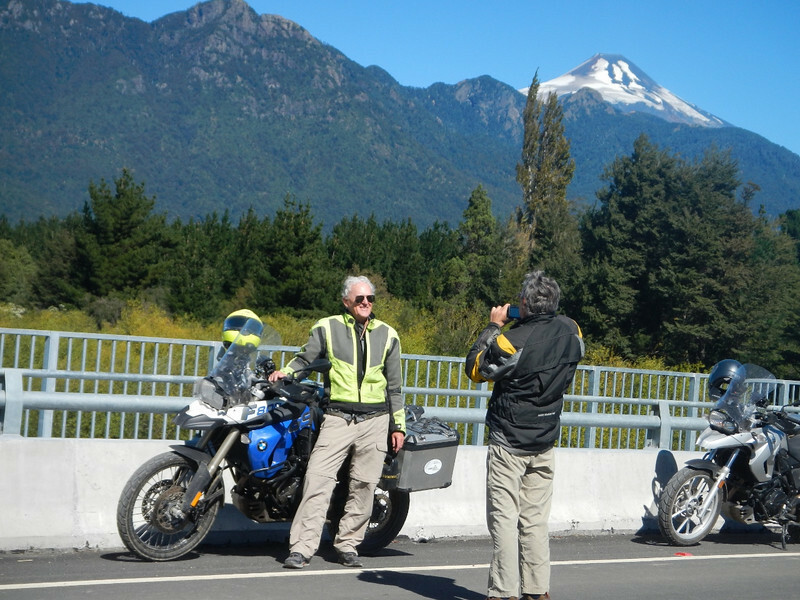 We rode in more fall like weather and it was easy to see how southern Chile could be compared with Oregon. About 3:00 we rolled into town. It was fantastic for Dave and Keith to return after 50 years. What was a small town with dirt roads 50 years ago was now a thriving tourist destination. I told them that they should take credit for starting the tourist boom since they were probably the first American tourists to visit this out of the way town. Here are some then and now pictures I stole from Dave’s blog post (you can check out his post HERE). 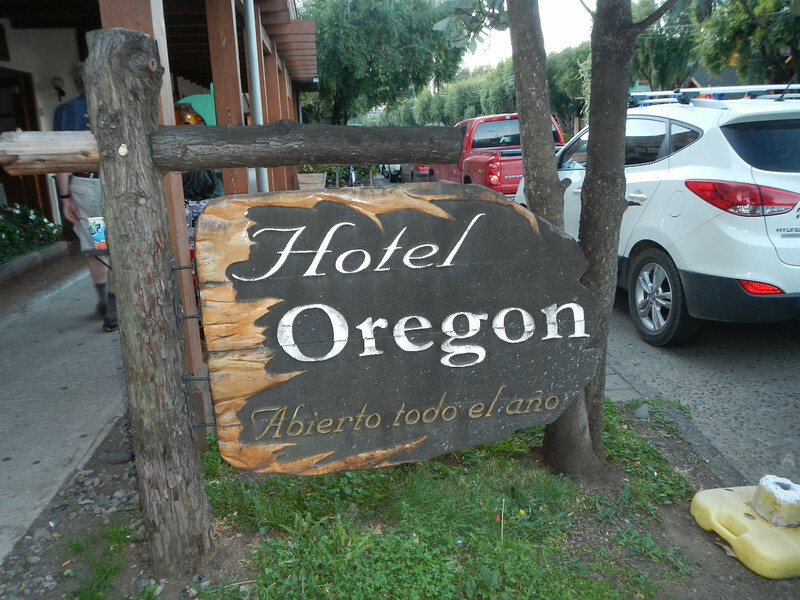 We saw a lot of things named “Oregon”. We learned that Oregon Pine seedlings were imported 40 to 50 years ago and are now used for most of the wood post and beam structures. Wow, what a connection! The city is overshadowed by the towering, active volcano Villacarra. Dave and Keith said it was cloudy the whole time they were here 50 years ago and they never saw the mountain. This was the only day we were to see it as well. 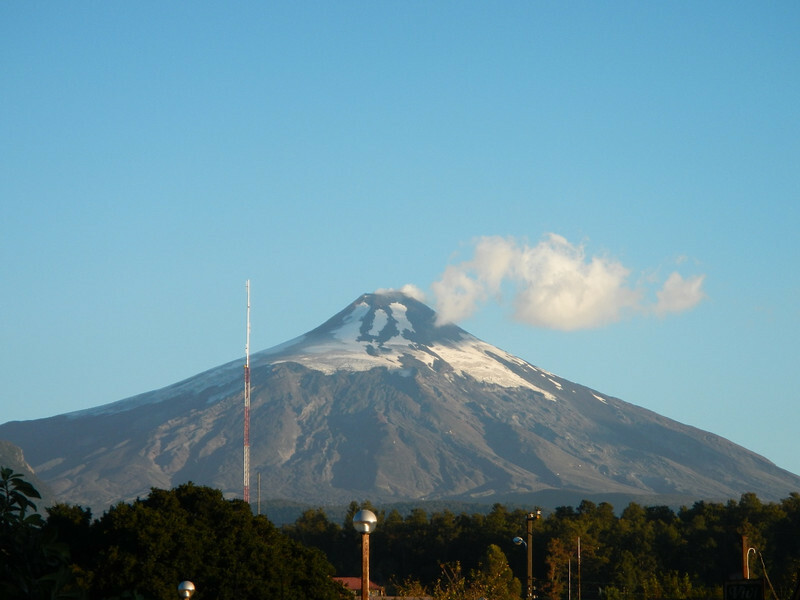 That’s smoke from the top of the volcano….. 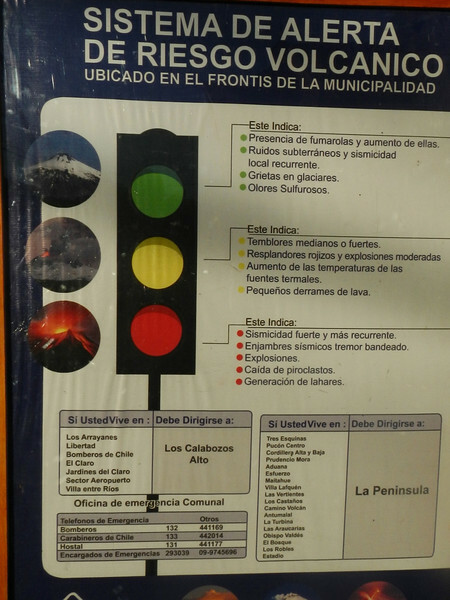 Being in the shadow of an active volcano the city has a system of lights to give the safety status of the mountain. Hey … why don’t we have this in Seattle for Mt Rainier or Mt St. Helens? On Wednesday we went out for a little ride around the area. Checked out the beach. 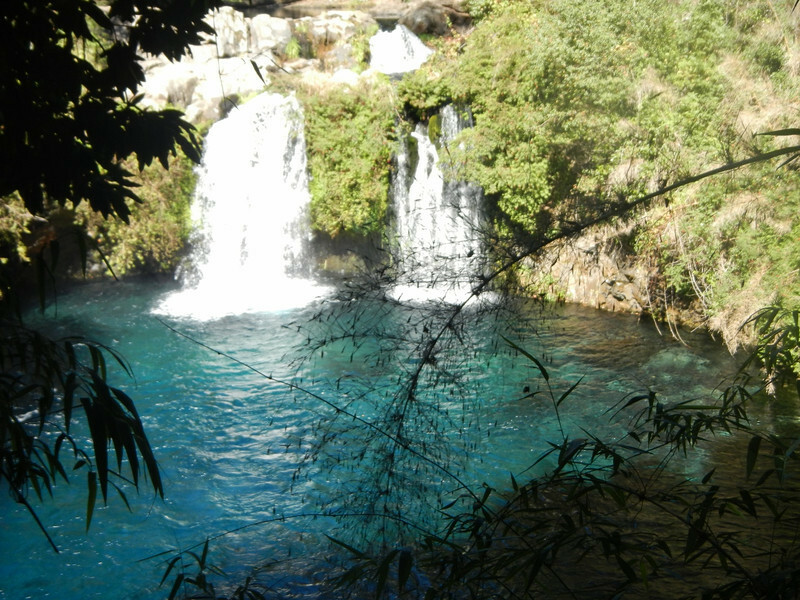 Hiked to some waterfalls. 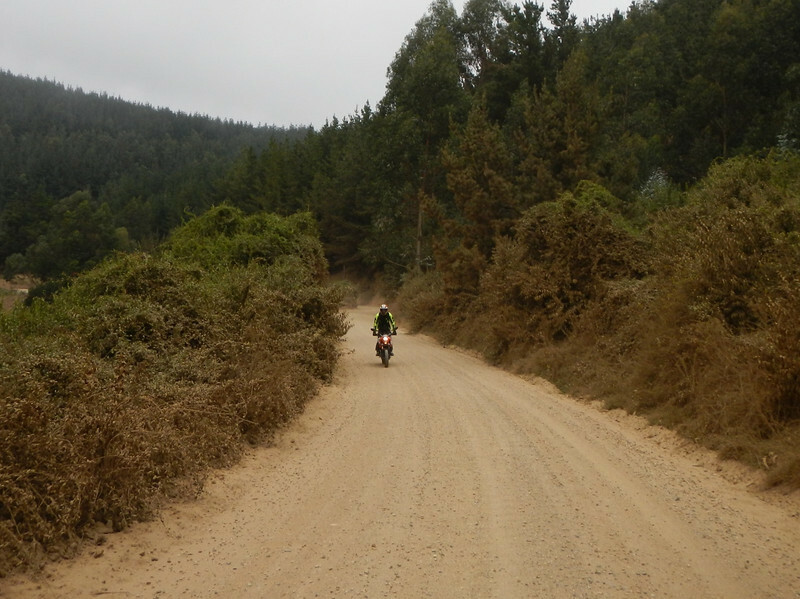 Which included more riding on dirt roads…. the dirtiest person had the most fun? Keith and Dave were having a blast! Reaching Pucon meant the trip was winding down for all of us. 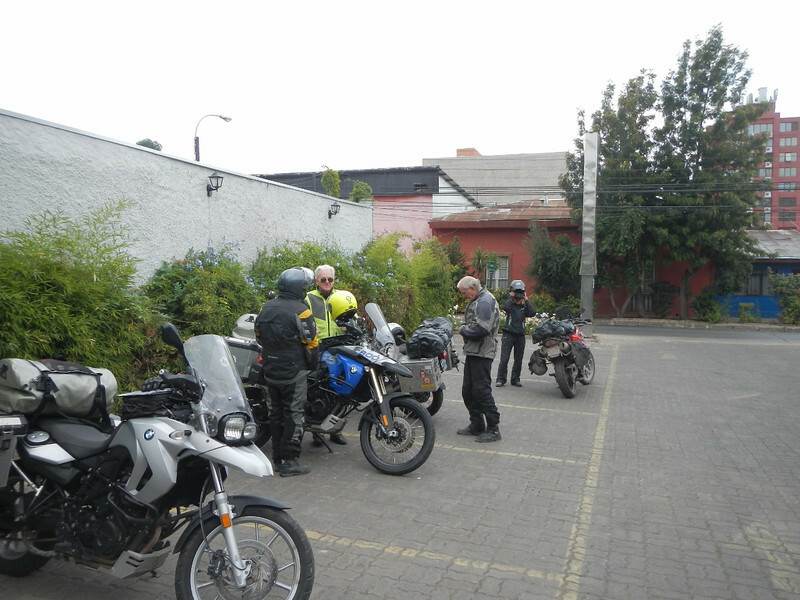 Over the past few days we’ve been busy making preparations to have the motorcycles shipped home from Buenos Aries and we all booked our airline tickets home. Michael made his reservations to leave a week before the rest of us and Wednesday was his last night with us before he set off on his own for the east. We all went out for a final dinner with all six of us. Michael had a large piece of Lasagna! We had planned to leave Friday but checked the weather forecast and the prediction was for heavy rain and then a week of sun. As I type this it’s dumping rain out the hotel window, another reminder of home. 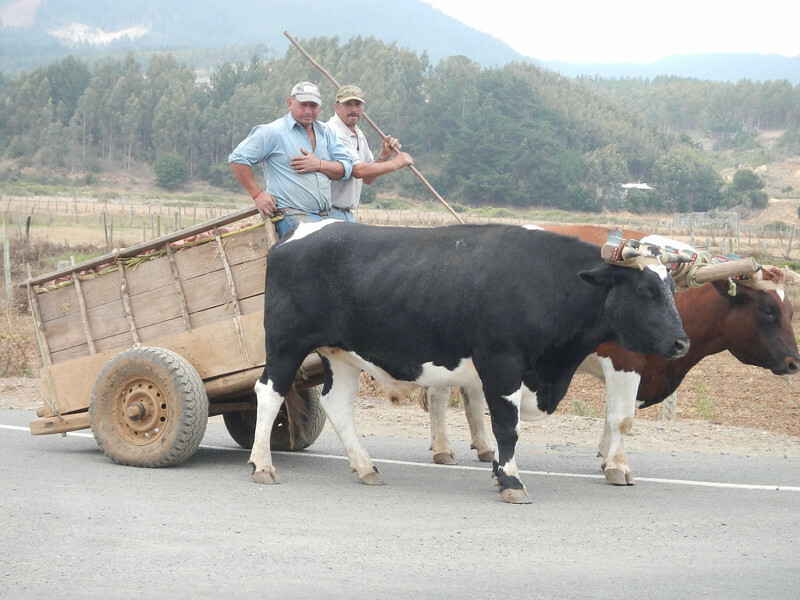 Tomorrow we make our way across the Andes, into Argentina towards Buenos Aries. We haven’t exactly decided on the route as there are many choices and we may actually split up for a couple of days with Deby and I going on some gravel roads and checking out a hot springs resort along the way. 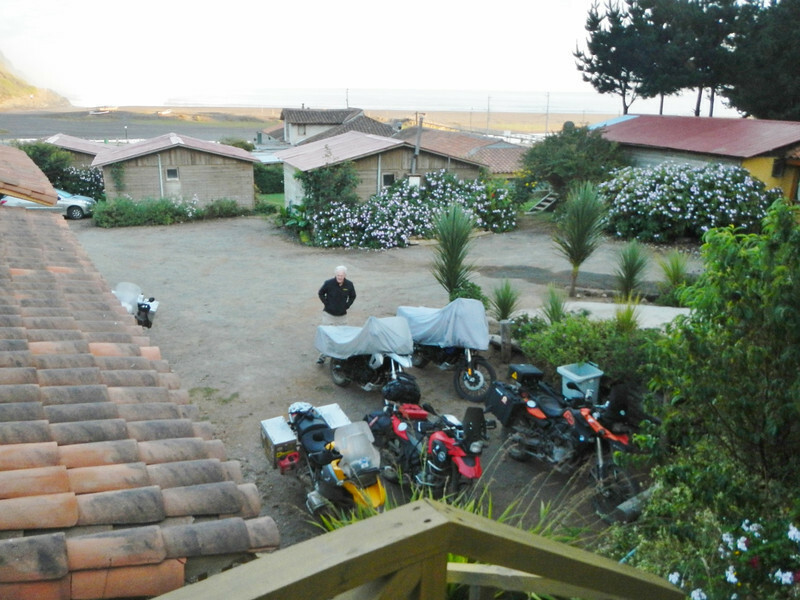 This entry was posted in 2013 Chile, 2013 Motoraid II, Motorcycle Adventure by donnh. Bookmark the permalink. Great write up. I’ve been really enjoying the blog. I did a lot of the same route last Jan-Mar. 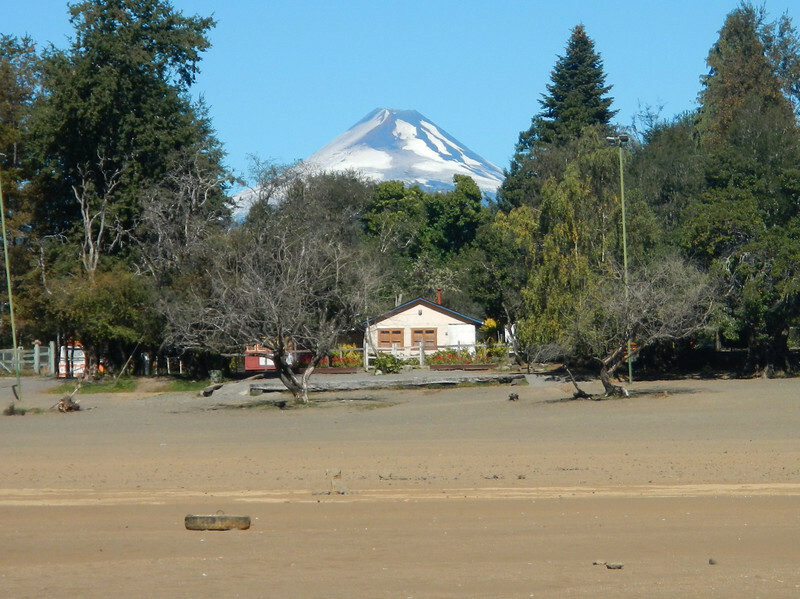 I actually visited Pucon on a backing trip back in ’05 and it is remains my favorite city in Chili. 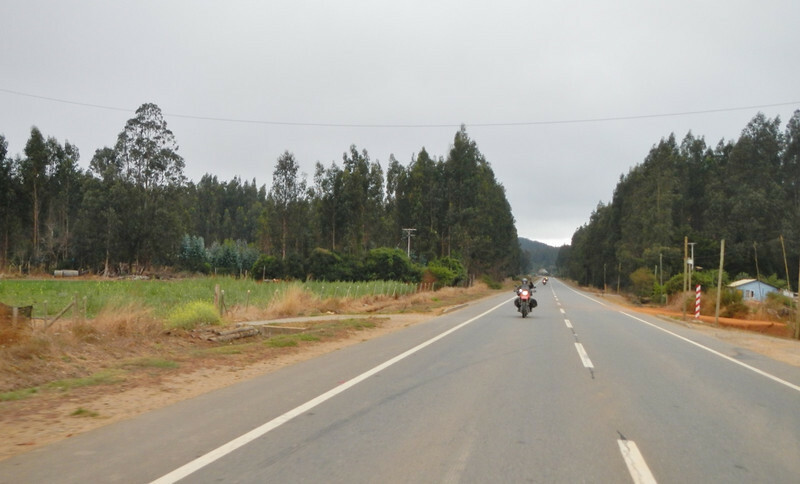 If you’re planning to explore Ruta 40, there is no gas in Tres Lagos, even though maps say there is. The nearest gas is 165km away in El Calefate. I learned the hard way! Stay safe! Why no fanfare, key to the city or marching bands? The Great Gringos from Oregon have returned and I haven’t seen any indication that its been acknowledged by the populace. Seriously though, congratulations to all of you for making it to your goal and having a grand time in the process. While we look forward to your return, we’re not sure the journey should end for our own selfless reasons as we are enjoying it almost as much as you. Vaya Con Dios Amigos! 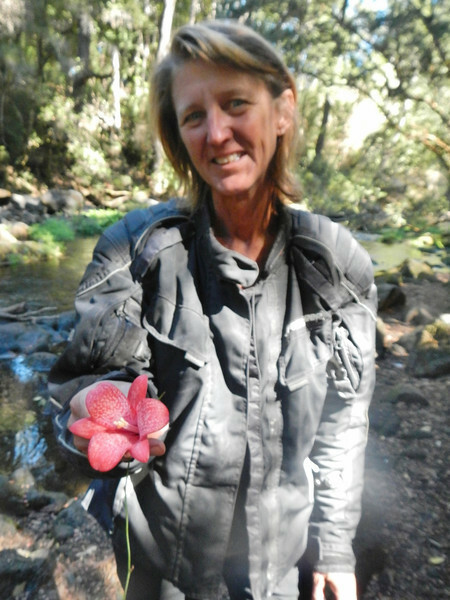 so much fun reading about your trip … so happy for you all !